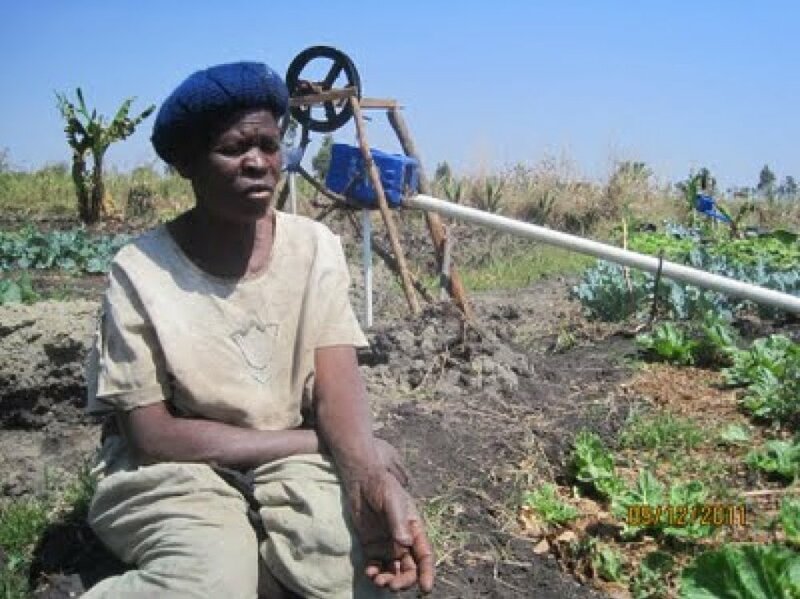 When AWP formed an agriculture club in the Village of Mziza to introduce sustainable irrigation farming, few women joined, but among the few was Khumbidze Kandodo. Khumbidze was born in 1948 in Mziza. She never had a chance to go to school in the colonial days. She used to wake up every day to help her parents do household chores and farming in the upland. She says, "back then, people did not cultivate in the dambo areas, for they had plenty food to feed themselves throughout the year." Ways of farming changed when the population started increasing, and there was continuous environmental and natural resource degradation affecting farm yields each and every year. As a result, people started cultivating in dambo areas. However, throughout the years that she has been in the dambo farming, she has had problems on how to improve soil nutrients and water holding capacity and, how to increase yield each growing season. To AWP staff in Malawi, Khumbidze has made a difference. Though she walks a long distance from her house to her garden, she has proved to the world that age is not a limit in development. She promises to do extraordinarily in her garden and meet some of her life needs she has never had in her life. She wants to errect a brick-fired house with iron sheets through farming with AWP. "I have never slept in good house with iron sheets. I believe, this will be my dream come true. I will be following every theory that AWP is requiring me to implement,” she foretells. I had time to go through her small garden and managed to take a picture of what she has done with her aging potential energy. The few months that she has been with AWP, the 63 year old widow, has managed to grow cauliflower, tomato, onions and green peas. Today we turned on the windmill to begin filling the reservoir. We are very pleased with the performance we saw today. We'll return on Monday to get the results of from the weekend. It's a beautiful structure rising out of nowhere on the edge of a dambo. Quite the sight to see! The tank is fitted with an inflow pipe just above and overflow pipe. 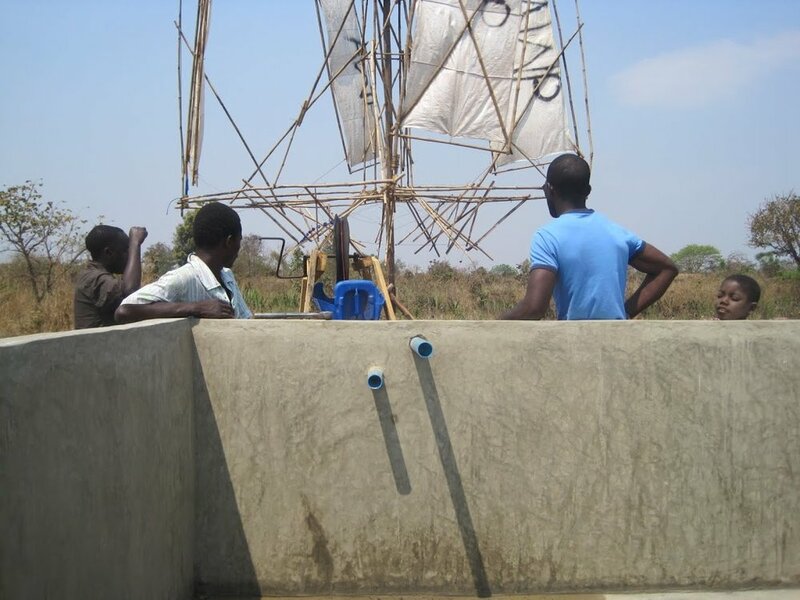 The overflow is directed back into the well to prevent excessive groundwater losses in the event that the tank is full and the farmer is not prepared to use any water. Ideally, the farmer would begin irrigating before the tank overflows so as not to waste any wind energy cycling water through the tank. Club members were all smiles seeing the pump fully operational. It isn't difficult to see its potential from this point, delighting even the skeptics in the group. The club intends to begin using the land around the tank as a community garden so that each farmer has an opportunity to learn how to irrigate from the tank. Keep checking in next week to see the results! Petros and Mr. Storo harvest broccoli for the first time. Lunch in the field consisted of a carrot wrapped with lettuce, a.k.a. "vegetarian hotdog" or "rabbit's delight"